PDP, others kick as APC erects party monument at Abuja city gate – Royal Times of Nigeria. 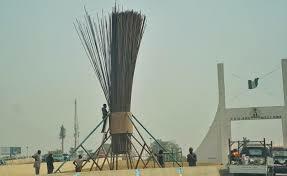 The opposition Peoples Democratic Party (PDP) and many Nigerians have condemned the ruling All Progressives Congress (APC) for erecting a gigantic statue of its broom logo at the Abuja city gate of the Federal Capital Territory, the city’s point of entry. They also criticized the Federal Capital Territory Development Authority for permitting the party to use the site for the erection of the statue, saying the action defeats the unity purpose of the FCT. The spokesperson for the Atiku Campaign Organisation, Kassim Afegbua, said the action is a deliberate decision of the ruling party aimed at offending the sensibilities of Nigerians. 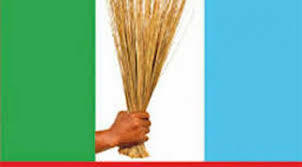 He called for the broom to be removed forthwith, else the opposition party will direct FCT public gardens officials to remove it immediately. He accused the political party of losing touch with its campaign messages to Nigerians, saying rather than focusing on attacking the ruling party, PDP should let the voters know what it would do differently if given the chance to govern the country again.